Kissing Tree is a 55+ community in San Marcos, TX. Brookfield Residential currently has plans to develop 3,200 single-family homes, making this community one of the largest in the state once complete. True to Brookfield Residential's reputation, Kissing Tree will have unique amenities geared towards the discerning 55+ homebuyer. The Mix, the name of the 20-acre amenity campus, was built in 2017 to be the community's social and physical hub. Independence Hall, the community clubhouse, includes amenities rarely found in other 55+ communities. Homeowners here have the chance to enjoy a biergarten and an indoor/outdoor bar. 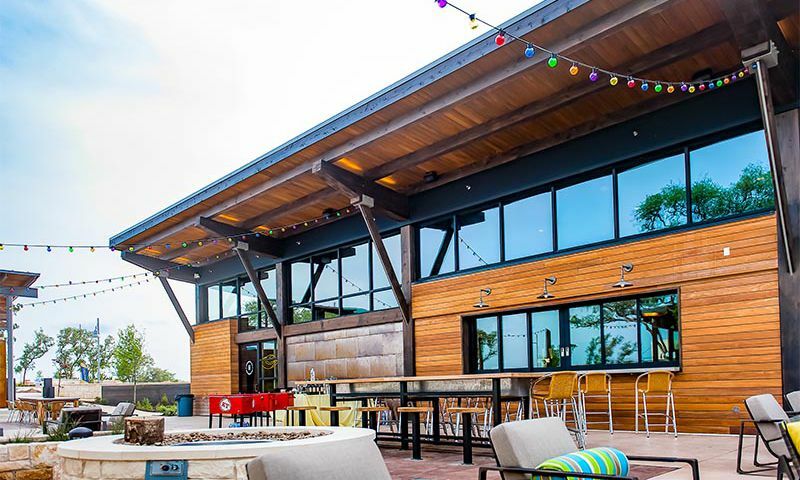 A demonstration kitchen, community classroom, billiards tables, live-music stage, as well as a food truck, fire pits, and more are also available to residents of Kissing Tree. Outside the clubhouse the amenities continue with 8 pickleball courts, 6 bocce ball courts, horseshoe pits, golf driving range, putting greens, and 15 miles of walking and biking trails. Homeowners enjoy an 18-hole putting course and a semi-private 18-hole golf course. Afterwards, residents can enjoy a meal at the golf clubhouse restaurant. Residents are also be able to stay in shape at the fitness center or go for a few laps in the indoor pool. Other outdoor amenities include a resort-style pool, patio, fire pit, and a barbecue area so residents can make the most out of the year-round outdoor culture of Texas Hill Country. Kissing Tree plans to include 3,200 residences upon completion. These homes will be built by Brookfield Residential, which will offer 18 different floor plans to choose from. They will range in size from 1,424 to 3,398 square feet. They will include one to four bedrooms, one-and-a-half to three bathrooms, and attached two or three-car garages. All models with come with a range of options such as gourmet kitchens, outdoor living spaces, as well as ample storage space, and casitas. An on-site activities director facilitates more than 100 clubs, and a variety of events and activities for residents. Just some of these activities include things like book clubs, luncheons, happy hours, game nights, and much more. San Marcos is becoming one of the premier towns in Central Texas as it's halfway between San Antonio and Austin. While it's within driving distance to these two world-class destinations, San Marcos is a popular destination in its own right and was the fastest growing city in the country in 2015. Residents of Kissing Tree are just a stone's throw away from all their shopping needs because San Marcos Outlets is just down the street. This massive shopping complex has clothing stores, restaurants, and a Neiman Marcus. Within a few minutes from the community is also a Target, JCPenney, Sam's Club, and movie theater. Both San Antonio and Austin, with incredible restaurants, museums, galleries, and culture are 45 miles away. Kissing Tree is a truly astonishing active adult community coming to Texas. There are plenty of activities available in Kissing Tree. Here is a sample of some of the clubs, activities and classes offered here. Brookfield Residential began development of Kissing Tree in 2016 and will build 3,200 single-family homes upon completion. These homes will range in size from approximately 1,300 to 3,500 square feet and will have gourmet kitchens, outdoor living spaces, as well as ample storage space. Please Note: Some floor plans are not available at this time. We have been under contract for over a year and a half and just received another delay notice. Unfortunately the build process has been excruciating. We experienced the same events that Scott B. mentioned and more. I keep hearing things are getting better, but that has certainly not been our experience. I would honestly wait awhile to see if things improve before I could recommend buying here. You can see how enthusiastic we were by my previous posting. I am trying hard to keep the faith. We just hope the community is everything we anticipate it to be. I do have to mention, the vast majority of the people we have worked with are some of the finest people I have ever worked with. I will update on the community if our home is ever finished. Two stars because of the concept and great people. My home is under construction. I have high hopes, but I fear serious problems are likely to happen unless we catch and prevent them. Brookfield does have their own QC staff but owners need to look out for themselves. Frequent visits to your job site plus careful review of your plans and billing estimates while in the planning stages would be prudent. Judging from discussions with current residents, my fears are well founded. The litany of issues was surprising given Brookfield's reputation in other developments. There were tens of thousands of dollars of duplicate and mistaken charges in our estimates. Some of the errors were to our benefit, most were not. It was not malicious, it seemed more to be sloppiness. I spent 40+ hours doing work at home between sales and design meeting, cleaning up the bulk of the mistakes. I cannot tell for sure because Brookfield will not provide a final cost until after construction is complete. Prospective customers should be actively reviewing their documents, based on our experience there is a significant chance serious pricing errors will exist. We have sought an explanation about how Brookfield plans to deal with a thirteen-foot elevation change from the front to the back of our house. The only answer we have is "Brookfield will comply with the San Marcos building code". Literally nothing - not on our plans, not in any of the design or architecture meetings, nothing from sales. I fear what we will get to choose from is either a two-story narrow concrete staircase or a $100,000+ proposal to build something more suitable for a 55+ year old resident all sprung on us in a surprise meeting late in the building process. It took eight months and four prospective sub-contractors to get a quote for the pool in the model home, less some of the features. Brookfield finally came to us with a $197,000+ quote. That was over half the base price for our home for a modest sized pool with a spa and decking. The price quoted seemed exceptionally excessive. I feel like the prospective residents have a neon "sucker" sign over their heads. Some of the items like fencing, pools & decking, extra cabinets etc. were gob smackingly expensive. This is not a knock at the sales and design staff. These problems originate with management and potentially are a harbinger of difficulties to come. We would seriously consider walking away from Kissing Tree if the cost to cancel was not an issue. Beware that the model homes do not reflect what is actually for sale at Kissing Tree. Do not expect anyone to point out these differences to you. Some of the items in the model homes can be purchased at extra expense while others can not be bought at any price. Even somewhat basic things like doors and windows will exist in a model home but be a plaster wall in your home. It is essential to go over your drawing / plans with exceptional care because what you saw in the model home is not exactly what you are going to get. We give Kissing Tree two stars rather than one because the project is only partially complete, maybe things will improve. At this point in time, we are angry, disgusted and a little outraged over the problems we have encountered so far. All we can do is hope for the best but fear the worst is yet to come. Got a chance to come back and see some progress on the community and it is very exciting to see. They have a lot of homes built and finished already and they have broken ground on the clubhouse campus! This is going to be an incredible community. It sounds like a lot of the facilities will be in by the end of this year and when they are, the residents here will be very busy. The homes are extremely unique and there are enough choices to find a style for everyone. Very excited to see how this community grows. 55places.com is not affiliated with the developer(s) or homeowners association of Kissing Tree. The information you submit is distributed to a 55places.com Partner Agent, who is a licensed real estate agent. The information regarding Kissing Tree has not been verified or approved by the developer or homeowners association. Please verify all information prior to purchasing. 55places.com is not responsible for any errors regarding the information displayed on this website.